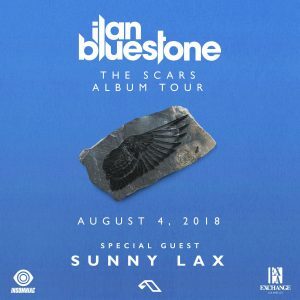 Since bursting onto Anjunabeats with his debut solo release back in 2012, London-based producer ilan Bluestone’s whirlwind journey through the international dance music scene has been nothing short of monumental. With a string of hit releases such as the Pete Tong-endorsed ‘Big Ben’, ‘Under My Skin’ and ‘Spheres’ under his belt, he now has an impressive array of live performances at venues as prestigious as London’s Brixton Academy and New York’s Madison Square Garden to underline his star status. In the last 12 months ilan has continued to dominate the Beatport Trance charts, with dancefloor anthem ‘43’ taking his tally of top spots to 9, and his ‘Snapdragon’ EP reaching #1 in the overall releases chart. ilan’s productions are a staple of Above & Beyond’s DJ sets, and gains frequent support from other international DJ’s including Armin van Buuren, Tiesto and Seven Lions. Taking inspiration from his love of 80’s music, ilan’s recent masterpieces ‘Cloudchaser’ and ‘Bonsai’ – included on his Anjunabeats Worldwide 05 compilation – showcase his wide range of musical talent. His collaboration with the legendary BT on ‘All These Wounds’, and remixes for Michael Woods and The Presets cap off a hugely impressive discography. At the core of ilan’s meteoric rise is his fanbase – a loyal and dedicated army of growing followers – who continue to flood to his shows to catch a glimpse of ilan’s explosive and uplifting sets – none more evident than at his recent EDC Las Vegas performance in a packed out Circuit Grounds stage. Ilan’s heavy touring schedule has seen him give momentous performances at Madison Square Garden for ABGT100 and Australia’s iconic festival, Stereosonic. He has also had a supporting slot on Cosmic Gate’s recent North America tour, to add to his impressive and expanding performance résumé. 2016 still has a lot more in store for one of the scene’s hottest talent.